Have a seat, the Doctress is in! I've tried to correct the links from the last post. But I think it's time to move on. Do you think Typepad is any more "link-friendlier" than blogger? I dislike cutting and pasting html code. Must find a quicker way to blog. Speaking of a bowl of spicy gumbo, did ya'll happen catch the hottest quilt at festival? A stunning piece in person! Breathtaking details on this baby. Please comment or email me if you know this artists name as I was too awe-inspired to keep good records. The light effect shooting off his upper cheek is....well, breath-taking! I've missed doll club for the last 2 mos. We didn't decorate for Halloween and I haven't had lunch with my baby once this year. My DH was off for the week and studied for his certification and little else. I did happen to cook & clean like a wench all weekend over Thanksgiving...and a Bonus: I made gumbo to share with you.....oh, and I'm almost finished with this interesting piece of something to become a future... Katy Bag by http://www.lazygirldesigns.com/ or something. 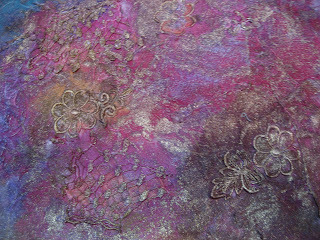 This technique is a mixture of Sue Bleiweiss' silk flower/Mistyfused layered collage with an article from Quilting Arts about weaved strips fused, stamped layered w/organza and stitched into cool fabric. 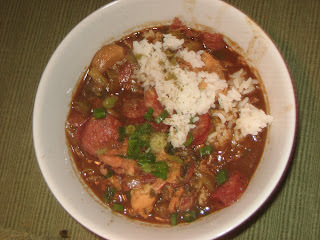 Like a freak, I documented my 2-day Gumbo expedition below. I've made gumbo 3 or 4 times in my life and each process has been completely different. I've always thought that to do it right, it takes a damned long time, from 2 days to 5 hours. You decide. It's all comes down to the roux Shah! Measurements do not have to be exact. I wing it here. 1 fryer chicken cut 'gumbo' style by your butcher. 1 link of smoked sausage sliced into round pieces. Fresh peeled shrimp - lump crab - not included in this batch but highly recommended! I've used pre-made chicken stock with chicken bouillons etc. 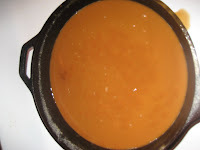 but this time I wanted to avoid the heavy salt in bouillion and wanted the flavor of my own stock. 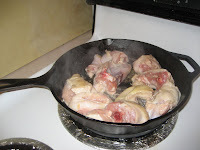 Sear that chicken in a pan w/oil. Add chicken to a big pot of water, add salt and pepper to taste. 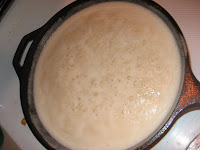 Bring to boil, then turn heat down to a simmer for 4 plus hours. Add salt and seasonings to taste. Add 1/2 cup celery and some onion in the last hour of simmer session. This time I added little (tea-dyed) cheese cloth wrapped balls of spice to the simmering stock and let seep for a couple of hours. In the cheesecloth bundles I enclosed red pepper, black whole pepper corns, oregano, basil, fennel...go crazy...and tied the mix up with string. Mucho flavor infused brew. 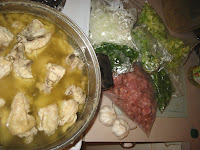 Allow finished pot of stock and chicken to cool. Separate into a couple of containers and submerge in ice water in sink. This will cool faster to avoid bacteria growth as you refrigerate overnight. 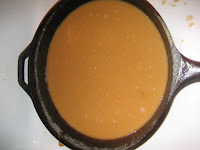 Skim the solidified fat from the top of containers and discard. Time to get your Roux on. Combine equal parts vegetable oil and white flour in a heavy skillet. I used a cup of flour and a 1 1/4 veg oil. Stir with wooden spoon to smash clumps until even and smooth. Turn fire to about medium low. Don't leave it! If specks of black appear, throw the whole damn thing out and start over. Okay stir frequently and have a glass of wine with music in the kitchenwhile you stir. No other humans are allowed in the kitchen during this phase. 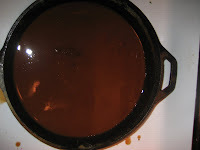 Watch as the roux gets darker and toasty looking. STIR! 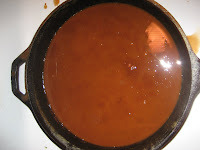 The phases of the roux! A dark chocolate or chicory coffee color is my goal here. Add chopped celery, onion, bell pepper, garlic to the hot roux and STIR and fry till onions are clear. Careful! It's very hot. 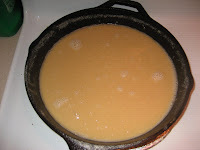 Start the roux in a nice deep dutch oven if you have one and pour in your warmed chicken stock. 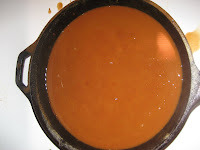 My method, transfer the roux in big spoonfuls to your simmering chicken and stock gumbo pot. Bring it all to a low boil and stir. Add peeled raw shrimp, crab, oysters, squirrel, gator, duck, possum, hamster, okra <-YUCK! i hate okra. Pour over white rice, sprinkle with green onion, hot sauce and enjoy with your favorite beverage. Wow. Where have I been?!! Gosh, i've been a bad blog mom. It's been weeks since my last post. Let's get the excuses out of the way shall we? I'm a workaholic. I sell, write ads and upload photos all day and all night so I've had less time and desire to be in front of a screen. I've been O.D.ing on the computer. It's my contribution to the credit card and gasoline debt. I've started running again and I'm feeling stronger, sleeping better and able to handle the stress. I've even lost a couple of pounds. I can wear my jeans. 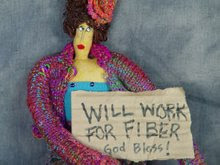 Oh, I met so many famous fiber people! What a wonderful evening! 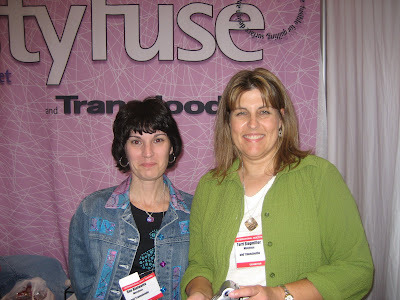 I met SueB and TerriS at the http://www.mistyfuse.com/ booth! 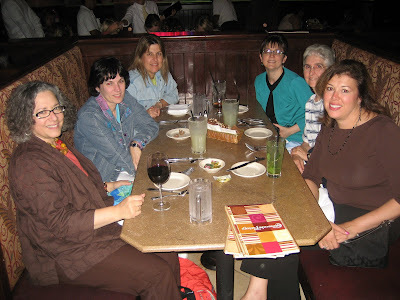 From the left Iris http://www.mistifuse.com/, Sue Bleiweiss http://www.sueb.typepad.com/, Terri www.stegart.blogspot.com, Vicky http://www.fieldtripsinfiber.blogspot.com/, Vicki's mom, and Me at Cheesecake Factory in Houston. What a wonderful night! I will be back to update tonights post. Happy THANKSGIVING!! 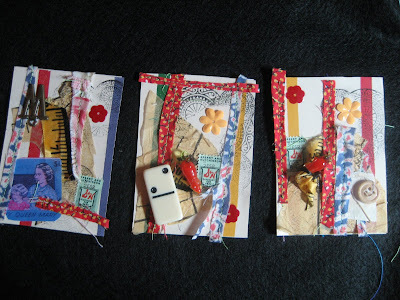 A few ATCs I made at my local monthly Texas Mixed Medians Yahoo group. 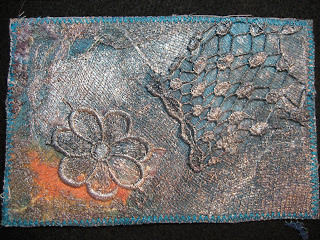 The members brought a huge selection of papers, found objects and just cool stuff to use and they shared their wonderful ATCs and inspirations. I think I've made maybe one atc in the past. This series was inspired by the green stamps they shared that immediately struck a nastalgic grandmaw maw memory nerve in me. These atc's are inspired by my little Maw Maw who paper pieced quilts with newspaper on her technically challenging (for me) pink Nicci sewing machine. 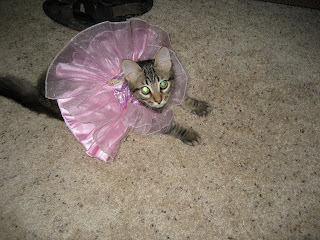 She'd take us to the TG&Y dime store where she'd buy notions and fabrics and of course treats for us. She and my mom saved up those green stamps and redeemed them for goodies. To me my ATCs mean Port Arthur in the 1970's, thick chicory coffee shots, zydeco music and my precious little cajun Maw Maw dancing in her slippers while she cooked us up rice and gravy. I couldn't wait to get out of Sunday Mass to dig into her roast and dirty rice! Ewwhewwwweeee!! 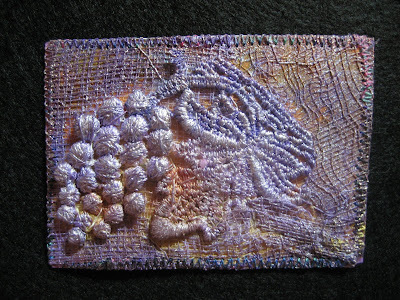 And an atc made from my lutradur and lace piece. To all the moms! What a mom would say in 24hrs condensed to 2 min and 55seconds. SHE IS THE BOMB. Have you experienced The Altered Book Videos of Susan Lenz? You must. I'm speechless. My favorite of hers so far: Becoming an Artist and "Black God" is just incredible too. * Have your sound ON as the music is part of the 'experience'. 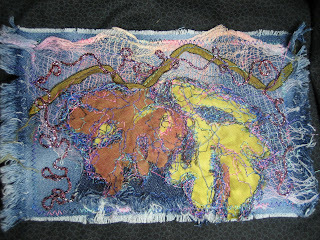 Susan is a prolific, extremely talented, emotionally-jarring fiber and mixed media artist! 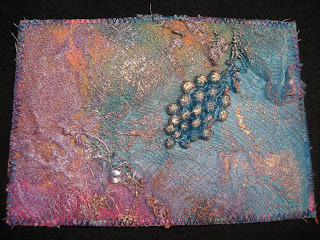 The newest online zine for fiber, paper, mixed media maniacs Fibre & Stitch is LOADED with step-by-step innovative fibre and mixed media techniques! 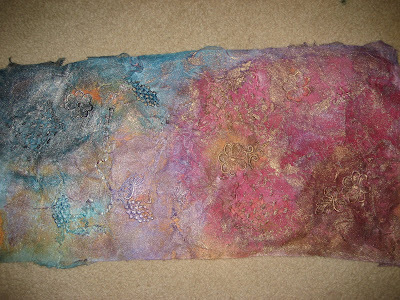 Like this lutradur & lace technique made with scraps of cotton lace, lutradur, and scrim (a glamorous name for cheesecloth) I had so much fun laying elements out and going Luminier paint crazy with this one. The fabric makes lovely postcards, book covers, elegant bags and who knows what else. I needed postcards to catch up pcs for swaps and this makes lovely cards! 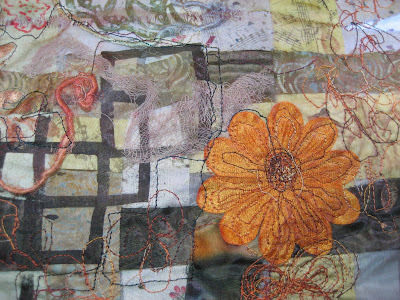 Carol is an F&S artist and shares her wonderful technique in the premier issue. F&S is full of Free Projects like the one I really want to make next..... Mag's Flexi Bag! Lutradur and lace may be too stiff for that project but www.textiletales.blogspot.com gives other Beautiful bag projects in F&S to make with Lutradur & Lace. The full piece before I fashioned postcards from it. 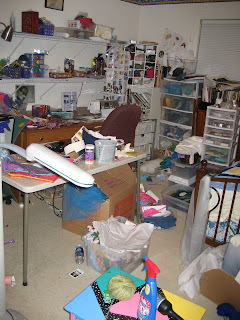 I will be making much more of this! 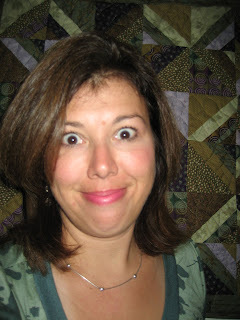 I cut my hair so I thought it was time to update my blog profile pic! Or should I use this one? Hmm...i dunno. I look a little intense. 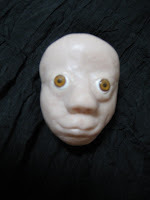 Ew or like my first attempt at a polymer clay doll head. I'm saving this guy for Halloween!! Trudi putting on her lips in mi casa at our MaterialGirls NW Playgroup. It was more of a "spa" experience! 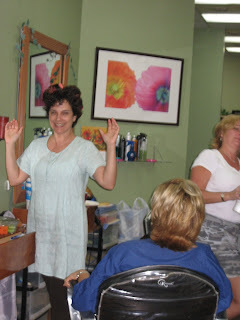 Mary getting beautimus at our monthly hair-therapy happy hour and HairSay! You are so foxy AND famous now Mary! 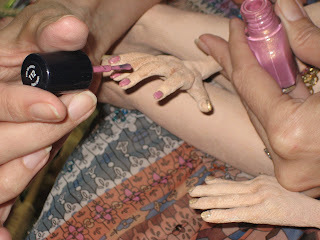 Laura performs a manicure and creates real nails on her hot-lookin gypsy challenge doll using Diamond Glaze by Judikins, then glitzes them up! Neva teaches us how to improve our soles at Material Girls this morning. 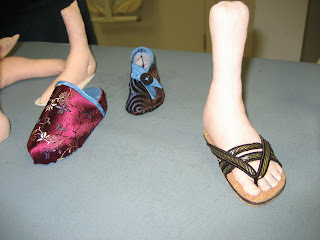 She gave us secrets of making feet and some of them are pretty crafty...like look at the bare-towed foot. Looks real huh! PSYCH!!! It's an amputee and I now have the confidence to try a foot like hers, no that I know Neva's Sole Secrets : 0! Laura's incredible doll made with multiple techniques. 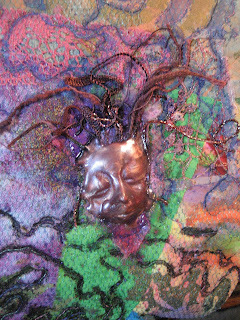 She used Paverpol, Luminier Metallic paints, over a crocheted piece to create the texture on her lower body. Just a gorgeous doll and talented artist! As a young thing, I worked as a Salad Bar Manager in a grocery store just after moving from Nederland, Tx to the big ole city of Houston. 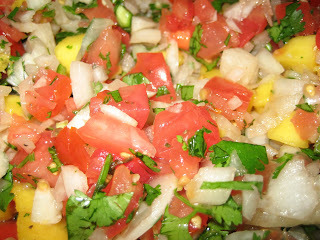 Armondo, my boss asked me to prepare "Pico de gallo" with the old tomatoes that our customers wouldn't buy. "What?!" I'd never heard of such a dish. "You want me to chop up tomatoes, onion, cilantro and serano peppers and then people eat that?!" I had grown up just 88 miles from Houston and the closest thing to Mexican food I'd ever gotten was Casa Ole. Houston has better Mexican, Latin, Cuban, South American....you name it restaurants than anywhere I've eaten in Mexico or the US (that I've been to anyway). So, tonight I bit right into a sweet Texas 1015 onion and my whole life passed before me. 1015s taste as close to candy as an onion can get and mixed in my mango pico, well it was truly orgasmic. Grandmas and aunts would freeze them in bunches and use them in their holiday dishes they're so good. 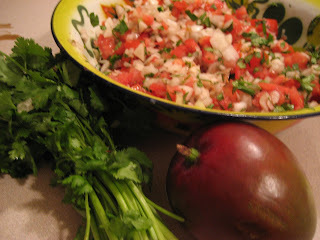 This recipe is basic Pico de gallo but with mango and jicima and Texas 1015s. Great on fajitas, as a salad with cucumber, or straight out of the bowl with chips! One Medium Jicama - peeled and chopped (The jícama [hee-kuh-muh, hik-uh-] (or yam bean) plant is a vine native to the tropical Americas . The root's exterior is yellow and papery, while its inside is creamy white with a crisp texture that resembles that of a raw potato or pear. The flavour is sweet and starchy, reminiscent of some apples. 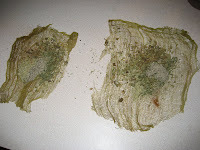 It is usually eaten raw, sometimes with salt, lemon or lime juice and powdered chili. Juice of 1 fresh squeezed lime. I prepare this the night before serving and add chopped avocado just before eating. There's something about foreign landscapes that draws you in. The gorgeous colors of an Indian sari, the soft sands of the desert, the red of a monk's robe and the blue of a tropical ocean, the green and purple of a grapevine and the golden fur of a lion's mane, you revel in it all. Even when you're at home, you bring the many beautiful parts of the world to you, surrounding yourself with glimpses of exotic places. To take this quiz yourself, just click'>http://www.amstamps.com/quiz/quizindex.html">click here! I started experimenting with opalettes from After Midnight Stamps and thought i'd melt some onto fabric and stamp a design into it. The design didn't show up, so I melted it again and again and threw one of the UTEE faces on and tried to adhere it with more heat. The face melted and distorted so I'm considering heating it up and trying something again. 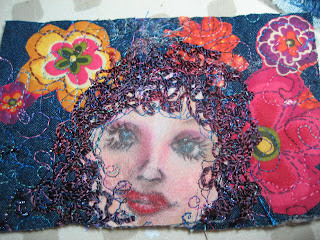 This was going to be a postcard for a Fiber Art Friend but i think it's too weird. We were having Akumal Beach withdrawals so yesterday we headed to Galveston for a beach, fried oyster, shrimp and Shiner Bock fix. 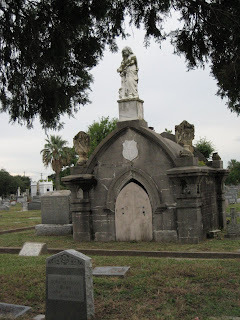 And a quick tour of Galveston's oldest cemetary. 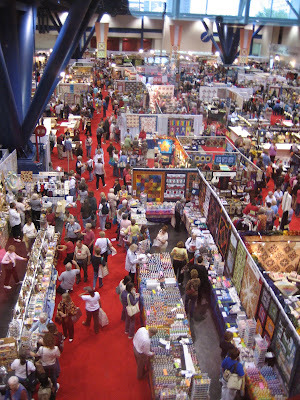 And I've started a new blog called RetailTherapy for chronicling Houston area local artsy supply haunts and included Galveston's Hendley Market as the first stop. Daddy Stitch, Lil Stitch and I had planned to leave for Mexico yesterday for a little Caribbean family fun. But a little ole Cat 5 named Dean convinced us to leave early last week with hopes of returning before the storm's expected arrival in Cancun yesterday. 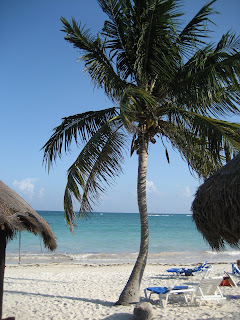 We landed safely in Houston Monday while our fellow Akumal Beach Resort guests were evacuated to a hotel in Merida. 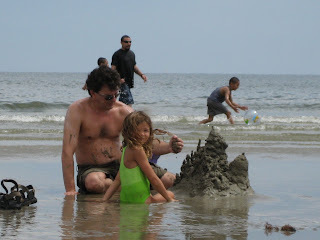 We are of course so relieved that this beautiful little beach village was not destroyed though damaged from the storm. We want to go back tonight. It was the best vacation we've ever had! 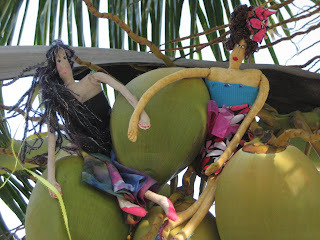 Cordelia and Esmerelda joined us for a much deserved girl's trip! They had many fans watching their poses and photo shoots. 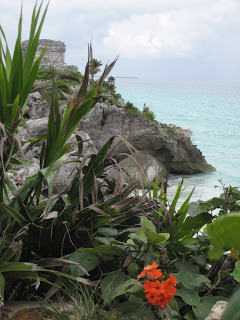 Beautiful beaches of Tulum. I think in a hurricane, I would like to stay in one of these Mayan temples. They're pretty tough! Lil Stitch snorkeling her first reef in Akumal Bay! 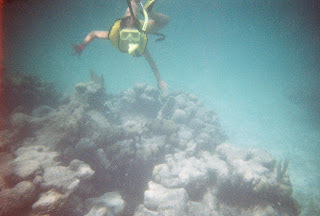 Daddy stitch and I adore diving but this trip was all about snorkeling with her. 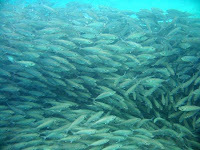 We saw the famous "wall of fish" in the bay, a cloud of thousands of slivery fish that swim together in near the same spot. LilStitch wanted to dive down into them but i was nervous as I who've dove to 100ft have never seen such a massive swarm of fish! The fish parted revealing the biggest baracuda we've EVER seen as well. I thought it was a shark he was so big. Baracuda are normally harmless in clear water as long as you don't mess with their food. We left the wall of fish. 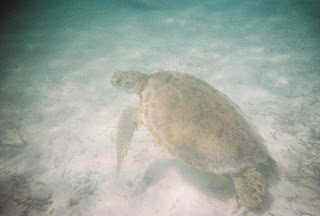 Akumal is the village of turtles and the locals take great care of the wildlife. In August, baby sea turtles hatch in their nests on the beach and run for the ocean. On our last night we were treated to hundreds of babies saved by the resort staff and brought to the ocean. The turtles get confused by the restaurant lights and run toward it! The staff surrounded and gathered the turtles in baskets. One of them was wearing a chef's hat which prompted my daughter to shout, "Mommy! Are they going to cook them?" I will be out of the zone for a few days on Holiday. Wah? With no access to phones, puters, email or anything! Bliss. 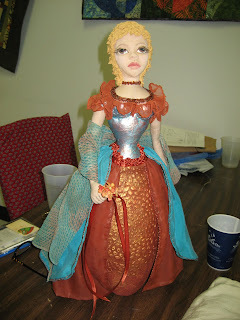 Check out the adventures of Cordelia, a living art doll and the brainchild of my friend Mary. Cordelia is a world traveler and has a full spread in this month's Art Doll Quarterly . She is off to a much deserved Mexican Caribbean vacation next week so look for her "waistin away again in margaritaville" updates. 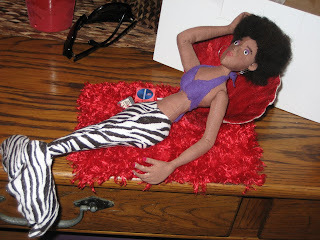 And just like all of us living dolls, Cordelia thrives on comments and compliments so leave a couple on her blog; Cordelia's Adventures . Real human secrets. Gut-wrenching and real. I'm sending mine on in. What about you? I think she's pretty. It's just that she had to apply her lipstick from the rearview mirror, while in the car and flying down the freeway with a mocha grande lodged between her legs. 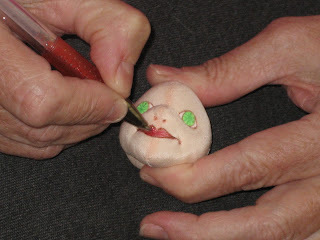 Sure, she can easily fix the lips with a little pencil at the red light. Or, the next time traffic comes to a grinding hault for no freakin reason. 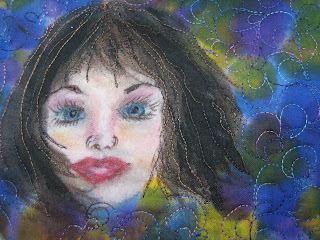 Making art restores my soul, heals my wounds and energizes me! This is the wildly creative journal and musings of a Texas wife, mother and hard-core crafter. This is a Flickr badge showing public photos from SeamRippstress. Make your own badge here. After Midnight Art Stamps and Opals! What's My Blog Worth? ..and when it gets to 30K, I'm selling!